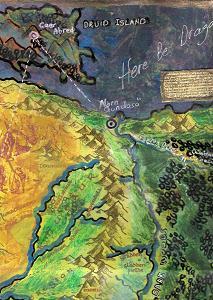 The Map, Northern Midgard, SG, 2011. The days had been rather nice since leaving Norn Gundasä. Vivian, Corwin, Tenwar and Ninraen easily fell into the routine they had created during their earlier travelling days together in Elvenwood. Tenwar and Ninraen acted both as scouts and hunters, and at night as sentinels around the fire. As before, the Elves and Corwin rode horses, while Vivian drove the wagon, pulled by her horse Nimrodel, which had arrived safely at Norn Gundasä. There were no strange encounters and the path was very clear though faint, rising among the gentle hills, meandering through woods still green from springtime. They were following the Gelden River upstream, which at this point was a young river. There was no way to cross it however, the two shores of the river being protected by high cliffs. I would never have thought that I would one day feel so comfortable with you, Vivian told Corwin one night, as Corwin put some apples that they had found in the wagon´s supplies into the glowing embers of their campfire. Corwin looked at her, apparently nonplussed. And when did you feel uncomfortable, my dear lady? Back at the Henge, Vivian answered. When I first met you. I thought that you were insufferably…arrogant! Oh really? Corwin raised his eyebrows in feigned shock. And what do you think of me now? I think…Vivian looked down at him. She felt the usual tenderness rising in her heart. Now I think that you are… insufferably…intelligent! Corwin said, I thought that you were the old-school kind of Druidess, uptight and correct. A…what? Explain yourself, Master Corwin! You know, proper Druid clothing, proper dressing code, all very…druidic (he chuckles), even your hair was…properly caught up. Now you are a real outdoorsy type, my dear lady! He looks at her, where she is sitting cross-legged on her rock, clothed in a dark brown velvet tunic gathered at the waist with a leather belt, dark men´s breeches too large for her, a heavy midnight cape and used-up leather boots, her hair all fluffy about her shoulders and smudges on her hands and face. You know…he starts, then he chuckles again. His heart is in his eyes. I really do like you now. Vivian smiles back, secure in his affection for her, and for a moment her face in the friendly light of their campfire looks completely unlined. I like you too, Master Corwin Goodfellow, I really do. I do hope that we get out of this alive, and that you will come down south to the Sanctuary with me. I hope that we will live to see the Sanctuary again. Corwin, on his haunches, looks down on the fire, and rearranges it so as not to burn the apples cooking there. I will see your Sanctuary, my lady, I am certain of it. Tomorrow we get to Dunbar´s Crossing, and after that, as I said yesterday, we are in the hands of the Storyteller. I am getting caught up in this romantic tale, and will follow it with enthusiasm……also the watercolors are so fresh and interesting, just beautiful. *sighs happily* Lovely… and so adore your map, and the other art (keep forgetting to say that, lol! ).